With Black Friday nearly upon us gift ideas are starting to cross people’s minds. And Parents, be warned: your child may be disappointed if there’s not a certain tablet computer under the Christmas tree this year. 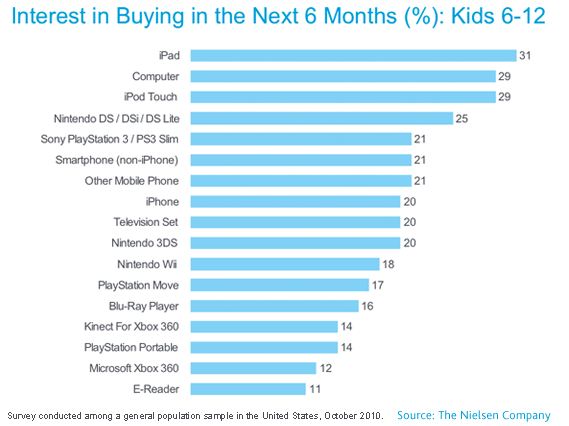 According to a Nielsen survey, Apple’s iPad is the number one item desired by children aged six through 12 beating out a computer (no particular brand specified) and an iPod touch. 31 percent of kids surveyed said they were hoping for an iPad with both a computer and iPod touch tying for second place with 29 percent of kids placing them on their lists. The Nielsen survey is officially titled “Interest in Buying in the Next Six Months,” but is widely taken as an indicator of popular holiday items among kids this season. Kids obviously didn’t have to choose just one item and simply had to indicate if they were interested in acquiring a given item or not. Console systems were the next most popular with Nintendo’s DS portable gaming system coming in at number four and Sony’s Playstation 3 at number five, desired by 25 and 21 percent of children respectively. An Apple product appeared for a third time on the list at number eight with 20 percent of preteens wanting an iPhone. E-readers were the least desired item surveyed with 13 percent of kids showing interest. Among members of the population aged thirteen and older, the iPad still remains popular with 18 percent saying they were interested in the tablet. The older crowd ranked a computer at number one (20 percent), followed by a television (nineteen percent), and a smartphone (also nineteen percent). The survey makes clear that the iPad’s popularity is still going strong even as rival table products, such as Samsung’s Galaxy Tab, begin to enter into the market. 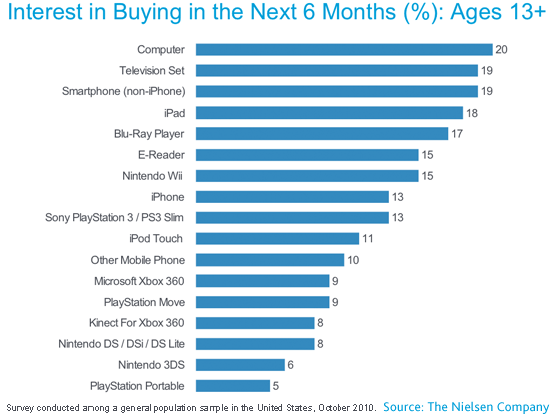 The big surprise is that the device beat out the Playstation 3 and Nintendo DS for the top spot among preteens. Grant it, the iPad is much newer, but it also indicates that the iPad is succeeding in appealing to a younger demographic who are most likely interested in the entertainment potential of gadgets. Nintendo will be reassured to see interest among kids in its forthcoming Nintendo 3DS portable gaming system which is not expected to launch until sometime during next spring. Nielsen conducted the surveys in October.